Review: This tells the story of enigmatic millionaire Jay Gatsby and his neighbour Nick Carraway. Jay Gatsby uses his fortune to buy his way into the Long Island Society. What he wants most of all is to win back the love of socialite Daisy Buchanan. Is his attempt ultimately doomed to fail? 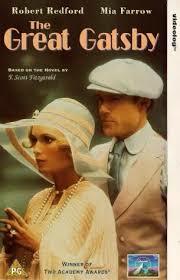 This was Paramount’s third stab at bringing F Scott Fitzgerald’s classic to the screen. The script was written by Francis Ford Coppola and at the time he lived in “West Egg”, aka Great Neck which was once a former house of F Scott Fitzgerald’s. Fantastic performances in this but especially by Robert Redford and Mia Farrow who are amazing and carry the whole film. The only thing I would have to say about this is that it is about 2 and a half hours long and for such a short novel the film doesn’t need to be that long. There were so many sequences that were so long and drawn out. It is a beautifully shot film. Marlon Brando was offered the part of Jay Gatsby but turned it down and also Liza Minnelli was offered the role of Daisy but turned it down. The themes that are very symbolic in this story is the decline of the American dream in the 1920’s and also the hollowness of the upper class. At the Academy Awards in 1975 this won 2 Oscars. They were for Best Costume Design and also Best Music, Scoring Original Song Score and/or Adaptation. At the Golden Globe Awards in 1975 this won for Best Supporting Actress – Motion Picture (Karen Black). At the Bafta Film Awards in 1975 this won three Awards. They were for Best Art Direction, Best Cinematography and also Best Costume Design.